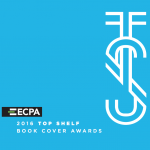 The Evangelical Christian Publishers Association presents the ECPA Top Shelf Award to promote and recognize outstanding book cover design in the Christian publishing industry. and additional information about each book. Designer: Cover and Wooden Character Design: Don Clark for Invisible Creature. To order a complimentary print annual featuring in detail each of these covers and featuring judge and designer comments, contact ECPA. This beautiful full color annual was designed by Faceout Studio and printed by Color House Graphics.